Backing band includes Calexico and vocal guests include Mark Lanegan (Screaming Trees, the Gutter Twins), Jon Auer (Posies, Big Star) and Rachel Flotard (Vizqueen). Coming Home is an album that straddles delirium and ecstacy, when the vultures circling overhead look like doves. Psychedelic desert pop music. It's the sound of a bead of condensation rolling down a beer glass at a grimy cantina. It's the sound of the glare off the windshield when you turn the '67 Caddy west. It's the sound after the gunfight. 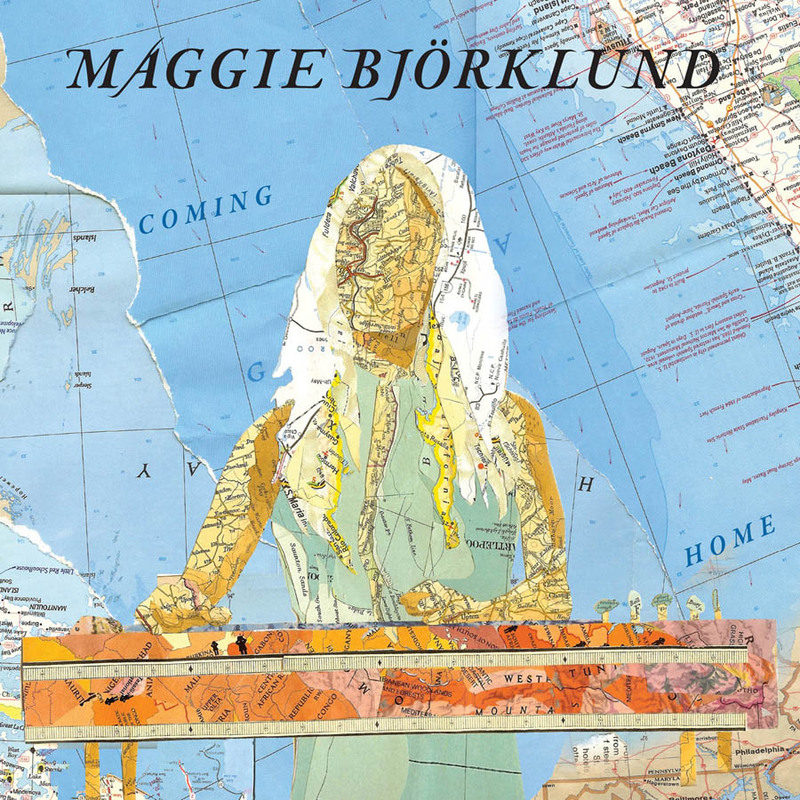 Maggie, despite being Danish, has nailed the wide open American West with her knockout pedal steel skills and resiliant vocals. Helping out on her American debut album are Calexico (Joey and John as the rhythm section and Jacob Venezuala on trumpet), and a hefty line up of Seattle veterans including Barrett Martin (drums: Skin Yard, Screaming Trees), Pamelia Kurstin (theremin: David Byrne, Bela Fleck), Johnny Sangster, (Mark Pickerel) Barb Hunter (cello: Greg Dulli, Afghan Whigs, Mark Pickerel). The album was produced by Sangster. And while there are some instrumentals, Maggie vocal guests include Mark Lanegan (Screaming Trees, the Gutter Twins) on "Intertwined" and "Coming Home," Jon Auer (Posies, Big Star) on "Vildspor" and "Playground Stars and Rachel Flotard (Vizqueen) on the enchanting "Summer Romance" and "Anchor Song." From a marketing perspective, we had to ask ourselves "why on earth would we put out this record? She's a completely unknown Danish pedal steel player?" Not exactly a Label Executives demographic sweet spot. But we could NOT get the album out of our heads when the producer handed us a copy. We HAD to put the record out, and that, my friends, are the best records TO put out. An album of exquisiteness, delivered in a manner that moves the listener to create images in their own mind to accompany the instrumentals or to let the warm songs wash over them as the bottle of red wine slowly empties. Despite the shuffle between instrumentals and a handful of different singers, each with distinct musical personalities, these 11 songs cohere into an album where the whole is superior to the many fine parts. Coming Home is an effective collection of late-night numbers that should serve as a calling card for a musician and songwriter with talent, style, and the know-how to make a truly memorable album. Coming Home should be one of those sleeper albums this in 2011. Bjorklund is able to grip you throughout the album and dissect your attention, and while it may not initially feel like you've just been examined. You just have this feeling thatComing Home has left a permanent mark on your psyche. Coming Home is loaded with musical talent and has such a free flowing brilliance to it that you can not do anything but sit back and enjoy the soft ride. [She's] created a near-masterpiece of the genre…the music is unimpeachable. Bjorklund's pedal steel voice - a blend of Bill Elm's processed grandeur, Eric Heywood's rich and elegiac swells, and the Nashville-flavored lines of Paul Niehaus - is all her own. It colors the instrumentals like desert blooms, and on the vocal tracks provides supporting accents or additional melody lines, turning soliloquies into soaring duets and duets into richly textured trios. An album of spine-tingling, spectral folk-pop. A rich, reverby, pedal-steel tinged landscape that sounds like the Twin Peaks soundtrack dubbed over a psychedelic spaghetti western. Shaken is full of potent memories and emotional outpouring translated into warm but dark sonic textures---sort of a rootsy Frankenstein’s monster with essences of Broadcast, Portishead, Serge Gainesbourg, and Ennio Morricone felt throughout. Kelly's voice is front and center as she treats you to a Dusty Springfield on a Staples Singers jag vibe. We'll let the hairs standing on the back of your neck decide if we're lying.